Our loose-leaf Statutes of South Africa is the only looseleaf guide to South African legislation. This product contains all non-repealed Acts from 1910 and associated references to Decided Cases and Regulations as well as a comprehensive Subject Matter Index to all (non-repealed) Acts that make up the South African legislation. 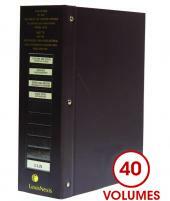 The printed product is published in 41 looseleaf binders with the Acts arranged under 94 subject titles. This is a bilingual service updated twice a year. Where an Act is available in Afrikaans, the Afrikaans text appears on the reverse side of the English text, allowing for easy comparison. Currently updated to Service Issue No. 53 - Supplementary and reflects the legislative position as at 16 March 2019. This edition contains the wording of sections, etc. prior to amendment, of the Acts included in the main work which have been amended by Acts. The purpose of Noter-up Service is to keep subscribers advised in note form of all material which will be incorporated in detail in the replacement pages issued with the Supplementary Service Issue as well as the Main Work.